Image courtesy of Not quite. When Joe ordered flowers for his fiancée’s birthday last week, his order wasn’t too fussy. He wanted 24 yellow and orange roses and a stuffed dog, delivered to her workplace, on her birthday. Things happen in the flower-delivery business, we know, and seasonal substitutions are normal and to be expected. What he didn’t expect, for his $70 or so, was to have half the amount of roses he ordered, in the wrong color and with the wrong stuffed animal, delivered to the wrong address, and nearly on the day after his fiancée’s birthday. For my fiance’s birthday on 7/13 I wanted to have some flowers delivered to her at work. I ordered on the 12th and specified a delivery for Wednesday the 13th. She was supposed to receive 24 Sun Drenched (yellow and orange) roses with a stuffed dog. On Wednesday I secretly took the day off while she was working to make plans for her birthday (home cooked dinner, etc.) so I come home from running these errands and see an order confirmation e-mail (after I’d already got one confirming the order) saying the delivery was scheduled for the 14th! I called the 1 800 number and they apologized for the mix up, said they’d have a local florist deliver the assortment as soon as possible. Fast forward several hours and my wife comes home, sans flowers. 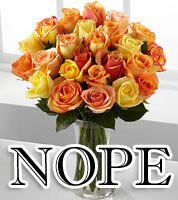 Eventually I get a call from the local florist asking if they can deliver the bouquet to the mailing address (our apartment) because they missed my fiance’ at work. The flowers arrive and it’s 12 red roses with a stuffed bear. The next day I e-mailed them to let them know what happened and to ask for a refund. I was polite, but firm and explained that since the order was not filled correctly, or delivered to the right place I’d like a refund for the order and a discount towards the next order wouldn’t hurt either. They called me back, but since I wasn’t able to answer they left me a message to call them back at the 1 800 number. I called them at customer service and the woman there was nice enough but seemed surprised that I called. I re-explained the situation and she said she’d have a supervisor look into it and call me back. That was Friday. I e-mailed them again today but is there something else I can do? I I feel like I’m getting ripped off and no one there cares. Lesson learned: if you must order from the FTD site and not the florist’s own site, call up the delivering florist and ask, “Hey, you guys have yellow roses and stuffed puppies there, don’t you?” The birthday clearly wasn’t ruined, but Joe at least deserves a refund and some replacement flowers for his trouble.